I seriously cannot go on holiday without a hat! When I was a child I was getting headaches from the sun and had to always make sure I was wearing something on my head when I was in the sun for a long time. I still ensure my head is covered when in strong sun for a longer period of time. 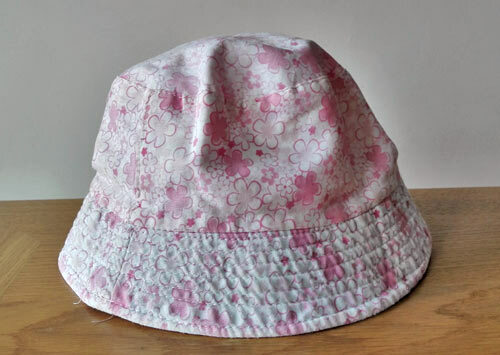 I lost my cap last year somewhere and the only hat I now have is this slightly silly looking white and pink hat which will do the job for now, but I really need a new one! Of course, I will also take my sunglasses to protect my eyes from the sun as hat won’t be enough. For keeping my immune system strong I am taking Bee Prepared from Unbeelievable, review here, and to keep my tummy happy I will also take probiotics capsules which I bought in Holland & Barrett a while ago. The make up I am taking is not going to take much space. I don’t normally wear much make up anyway, only mineral foundation (My Beautiful Earth, satin glow) and Benecos green eyeliner which of course I decided to take with me. For the evening I also added a lip-toned lipstick from Une and a mini mascara (Jane Iredale) which was in this month’s beauty box from Naturisimo. That’s my make up sorted! 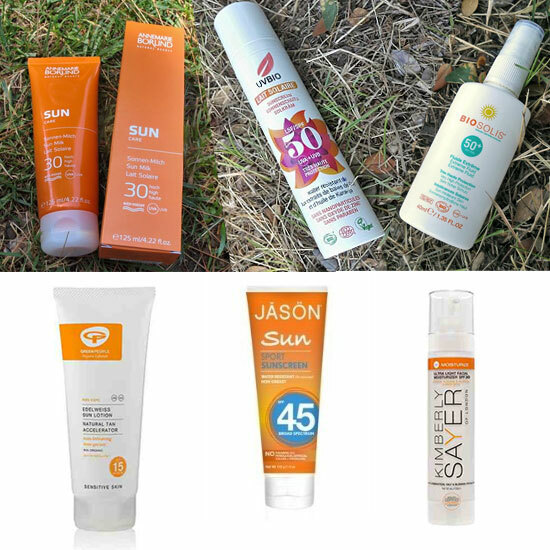 Sunscreen is the most important out of all the skincare products I am taking with me and for this I am still using Annemarie Borlind sun milk, SPF 30 which I bought last year in Slovenia. You can read the review of this sun milk here. I am also taking a couple of samples of Kimberly Sayer light facial moisturizer with SPF 30. I bought these samples from Naturisimo only recently and really look forward to trying this out, especially because it’s suitable for combination, oily & blemish prone skin. For daytime or evening face moisturiser I will use Daily Detox Cream from Bloom Remedies, recently purchased. I am currently using their sample size (30ml) and so far it’s been working great on my skin. I love the lightness of it and how it works to help to prevent any blemishes. It will be perfect in hot climate. If you want to buy a sample, you can still get it on their website for £5, including postage. For showering I am taking Faith in Nature Hemp and Green Tea soap which I will use for other things as well like shaving, face washing and hand washing. I love this soap as it doesn’t dry the skin out and it’s small so it won’t take much space in my bag. Another staple skincare product for me is toner and at the moment I am using Rose Extraordinary Water from Melvita which is hydrating and contains hyaluronic acid which helps the skin lock in moisture. 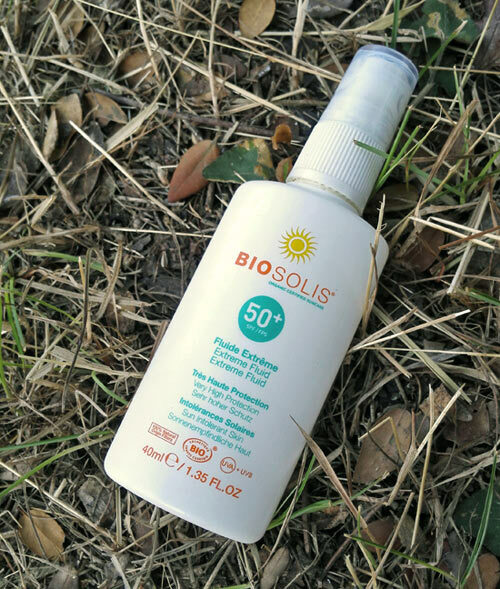 I find this product well suited for combination skin but just to mention the consistency – it’s going more towards serum consistency than consistency of normal water based toners. For this reason it’s probably technically not a toner as such but it’s still great to use after cleansing and underneath my moisturiser. What I also need on my holiday is an eye make-up remover and the Terra Naturi eye make-up remover I am taking with me has been given to me as a gift and it does the job. If you are interested, Terra Naturi is a budget German natural beauty brand and their products are suitable for vegans. For those dry skin patches, anywhere on my body, Weleda’s Skin Food is the one! So far this has been great on my feet, elbows and face. It contains calendula and chamomile extract so I think this will be also good for sunburn (if it happens) and possibly insect bites. I am not sure, will just have to try it! I am currently testing a sample of Cucumber & Watermelon serum from LJ’s Natural and so far I am loving it so I decided to take it with me. I cannot live without the tea tree oil! I need this for when my skin breaks out as tea tree oil is great for drying those spots out. Tea tree oil also has many other uses, for example, it’s great for soothing irritated scalp and fighting dandruff (just add a few drops to your shampoo although you could also buy yourself one of the tea tree oil shampoos out there, just to make your life a little bit easier). 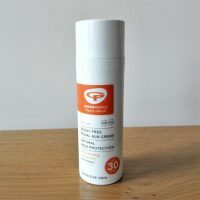 Deodorant is essential for almost everybody and my favourite natural deodorant at the moment is Lavera soft deo roll-on Lime Sensation. I have a couple of different shampoos and conditioners at home, but I decided to take Neem Shampoo from A. Vogel * as this is currently working well for me – my hair gets greasy quickly and this shampoo helps it to stay fresh for longer. The conditioner I decided to take with me is DGJ Organics HairJuice Clarifying conditioner which leaves my hair feeling soft and looking healthy (read the review here) and I think it will help my hair looking great in hot weather. I will leave serum for dry ends at home as I am sure I could survive without it for a week. I would love to take hundreds of other beauty products with me but unfortunately I can’t. It may seem like I am taking loads of stuff already but I am yet to put everything in small bottles and containers so it wouldn’t take that much space and weight. If you went for a week long holiday what health and beauty essentials would you take with you? 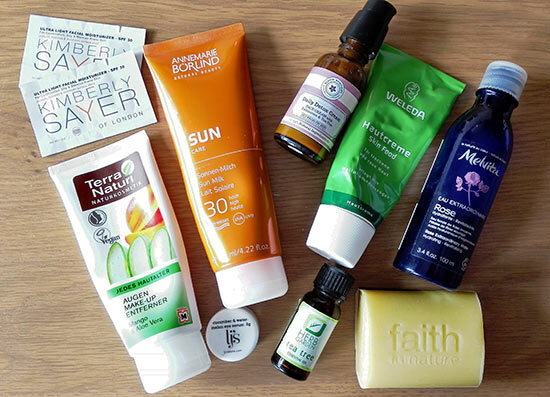 Last year I posted about the same topic (http://greenconscience.de/2014/08/kulturbeutel-und-make-up-fuer-4-tage-schweiz-pack-light/), I take with me mostly travel size and multi purpose products. My lip colours go in an eye lens container, that saves weight and space and the colours double-work as blush, too. Taking multipurpose products is definitely a must if you want to save space. Great tip about your lip colours and thanks for the comment! I want to start using more natural brands!